From gigantic granite walls and thundering waterfalls to emerald green valleys and giant sequoias reaching for the skies, Yosemite is undoubtedly a celebrity amongst national parks in the United States. Inspiring a perpetual sense of wonder and reverence, the park plays host to millions of visitors annually, several of who come to exploit the diverse options of landscape photography within its multifaceted terrain. On a beautiful autumn day, my friend and I set out to explore a world of another kinda world that welcomes you with its chirping birds, fluttering butterflies, the rhythmic hum of waterfalls and pristine wilderness. Yosemite National Park located in California, USA is a nature lover’s paradise. Stretches of untouched greenery, deep valleys, grand meadows and ancient sequoias make it an ideal place to feel one with nature. The surreal terrain provides a lot of scope for photography and I was excited to capture the microcosm through my lens, even in the span of this short trip. Yosemite is considered to be the second home of legendary landscape photographer Ansel Adams. He visited the national park every year till his death to capture the beauty of this place in his poignant black-and-white frames. The majestic sights of Yosemite National Park continue to delight and inspire visitors of all generations even today. According to the Park’s history, President Abraham Lincoln signed the Yosemite Grant in 1864, which eventually ceded the erstwhile Yosemite Valley and the Mariposa Grove of Giant Sequoias to California as a state park. This landmark decision paved the way for a national park system of which Yosemite became a part in 1890, thanks to efforts led by pioneering conservationist John Muir. Roughly the size of Rhode Island, the park is a UNESCO World Heritage site and contains five of the seven continental life zones. 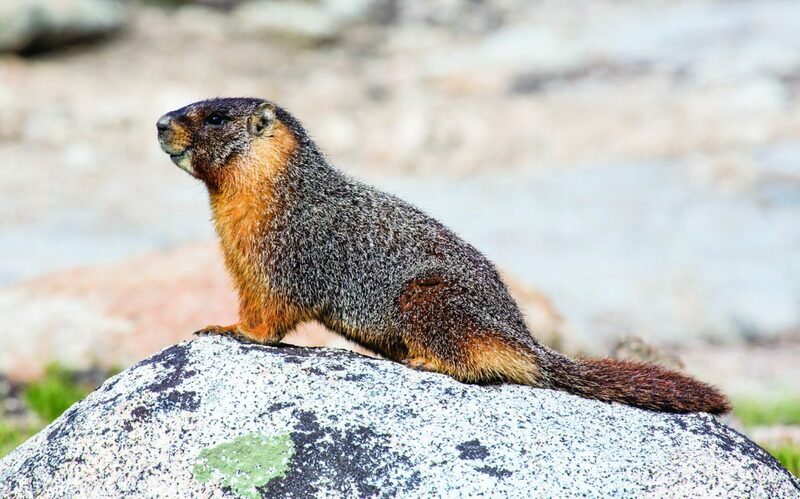 Habitats here include the valley and the heights, near deserts, mid-elevation forests, mile-high forests, and Yosemite’s majestic mountains – indeed, several worlds ensconced in one! Located only a few miles away from San Francisco, we drove down to the national park to spend a few days amidst the breathtaking scenery. We spent most of the afternoon of day one exploring the place and hiking around the campsite. And as dusk approached, we trekked to the magnificent Glacier Point; it offers a panoramic view of Yosemite Falls. Almost from the park’s beginning, Glacier Point has been a popular destination. After the Four Mile Trail opened in 1872 and a wagon road to the point completed thereafter, it is now possible even to drive up to the site. The hike up to the Glacier Point was made even more beautiful by the sky that was lit up in stunning washes of azure and scarlet…truly a sight to behold. The entire eastern Yosemite Valley spreads out before you, from Yosemite Falls to Half Dome, as well as the distant peaks that ring Tuolumne Meadows. Half Dome hovers practically at eye level, and we could spot the rock climbers in the distance making their way up in the middle of the night with just the aid of headlamps. The starlit sky, cold breeze and the spectacular view couldn’t have been a more perfect setup to capture the moonrise at midnight. Yosemite at night, under the soft glow of the full moon is indescribable; it looks like a different planet altogether. Meanwhile, we were ravenously hungry and olished off the pizza that we carried from the campsite. We finished the shoot at 3 a.m. and headed back to sleep in our car instead of the campsite, wanting to capture the first break of dawn. We woke up early enough to catch the first rays of the sun. It was a memorable vision and we drove to El Capitan and Three Brothers to shoot the sunrise. A giant vertical monolith in the Yosemite Valley, El Capitan extends about 900m along its tallest side, and as the largest exposed granite monolith in the world, it is among the world’s favourite challenges for rock climbers and BASE jumpers. Located just east of El Capitan are the Three Brother’s Peak – comprising Eagle Peak (the uppermost ‘brother’), and the Middle and Lower Brothers. It is believed that Muir considered the view from Eagle Peak as the most beautiful view of Yosemite Valley, and we were inclined to concur. At sunrise, the vision ahead glistened like gold, making the whole place seem alive and ethereal at the same time. Geographically, Yosemite is vast and cannot be explored entirely with even a reasonable timeframe in hand. Given our short trip, we decided to savour our time scouting stunning photography sites rather than traversing the formidable length of the park. 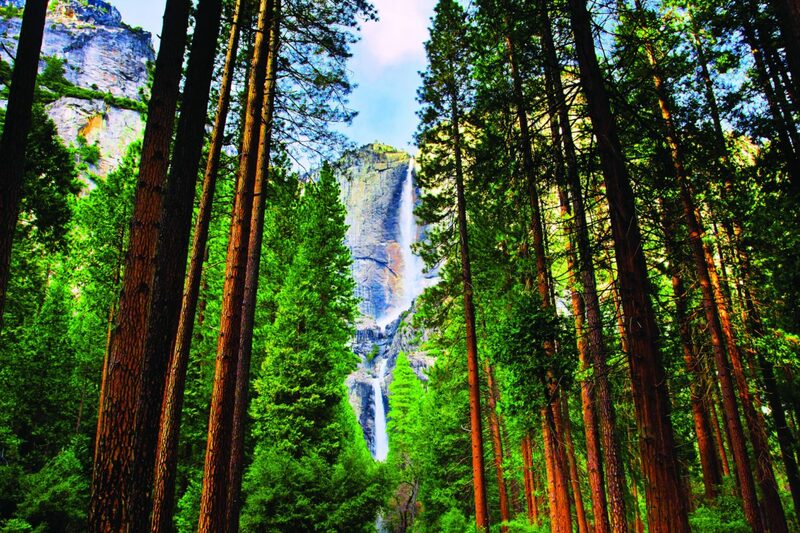 However, those staying for longer should undoubtedly check out some of the most famous natural features in the park – these include the majestic Mariposa Grove of giant sequoia trees, the largest living things on earth, located not too far from Glacier Point. The Grizzly Giant and the Fallen Wawona Tunnel Tree are two of the most photographed sequoias here, and there’s even a museum for first-time enthusiasts to learn about the ecosystem and history of the place. A haven of impressive natural features, Yosemite’s waterfalls are quite simply unforgettable, with the thundering Yosemite Falls being the tallest of them all at a jaw-dropping 740m, cascading in three tiers. There are trails leading to the bottom of the falls and even an arduous hike to the top where you can truly earn the rewards after a gruelling 5.5 km trek. Nontrekkers need not worry. A large part of Yosemite— nearly 282 miles—is navigable by road and all major attractions can be accessed through it. Like several other well-developed national reserves through the country, Yosemite’s museums and visitor centres offer a wealth of information on the region’s history, its native cultures and tribes and the indigenous wildlife that thrive at several altitudinal levels of the park. 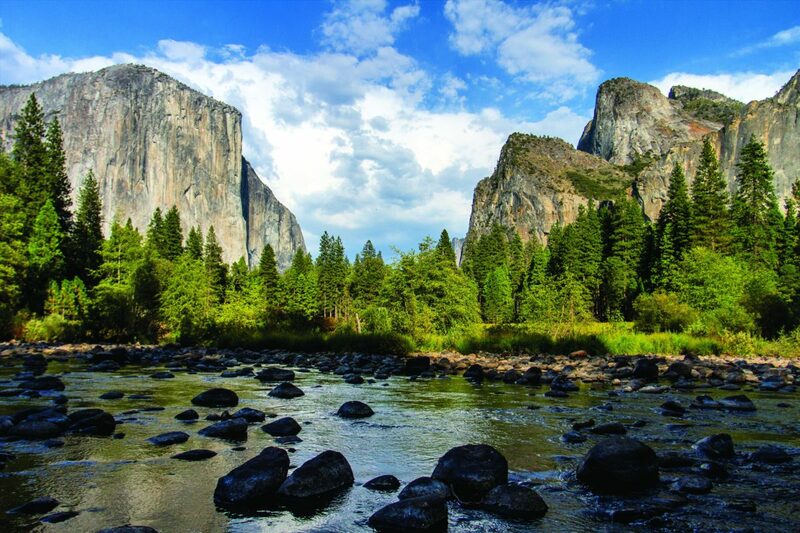 Some popular indoor destinations that you should definitely add to your list are the Yosemite Museum next to the Visitor Center, with over 4 million items of natural, historical and cultural interest in its collection, the Ansel Adams Gallery, and the Mariposa Grove Museum. We ended our journey after a quick visit to the Yosemite Museum and took in the decades of history and preservation that has made the place the wonder it is today. As we took in the last glance of what this immense national reserve has to offer before heading back to the city, John Muir’s quote kept running through my mind. He had said, “Climb the mountains and get their good tidings. Nature’s peace will flow into you as sunshine flows into trees. The winds will blow their own freshness into you, and the storms their energy, while cares will drop off like autumn leaves.” We couldn’t agree more. San Francisco, Oakland, Los Angeles, Sacramento and San Jose are all gateway cities to Yosemite and you can fly into any of these airports. From San Francisco, drive east on Highway 580 to Highway 205, east to Highway 120, and then east to Yosemite. Give yourself about four hours to get into Yosemite Valley. The Yosemite Area Regional Transportation System (YARTS) provides bus service from many of the communities outside Yosemite. Yosemite National Park is open 24 hours per day, 365 days per year, and no reservations are required to visit. However, the Hetch Hetchy Entrance Station is open only during daylight hours (approximately) and some roads are closed due to snow from around November through May or June. The admission fee, valid for seven days, is $20 per vehicle or $10 per individual. If you plan to camp in the back-country or climb Half Dome, you must have a wilderness permit. It’s best to make a reservation, especially if you will be visiting May through September. Cell-phone reception is often fine in the valley but hit-or-miss elsewhere in the park. There are public telephones at park entrance stations, visitor centers, and restaurants. There is no bank, but the stores in Yosemite Village, Curry Village and Wawowa all have ATMs, as does the Yosemite Lodge at the Falls.